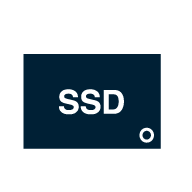 Solid State Disks (SSDs) replace the mechanical hard drive as a much faster option. SSD is more resistant to shocks, is completely sound and vibration-free, as well as more power-efficient. The price is generally higher per gigabyte compared to mechanical hard disks, but the benefits weigh up. Here, for example, you can filter on storage size, form factor, connection interface, and speed.